To fans of the 12-string bass, Tom Petersson needs no introduction. Cheap Trick recorded 'At Budokan' in 1978, an album which firmly established the band and set the standard for the sound of the 12. Over the past 25 years Tom has worked with several different companies to create new styles and improvements on the original models. Tom continues to play this instrument on stage, which in our view is the ultimate bass guitar. Tom's name is now permanently linked to the 12-string bass, and finally a bass is linked to Tom's name with the introduction of the Tom Petersson Signature series 12-string basses from Waterstone Musical Instruments. A signature line is long overdue, and from all indications these new basses have become an instant success. It is our great pleasure to present to you the man who is responsible for all of our madness...Tom Petersson! You have had an eye for classic and vintage basses for a long time. How did your interest develop? What do you look for in a vintage bass? Working with guitarist Rick Nielsen since 1968 definitely helped develop my love of vintage instruments. We’ve always had a bit of a snob thing going on with vintage from the beginning. You know, anything made after 1969 is complete excrement. It’s not totally true but it makes for lots of laughs for us at other’s expense. What I look for in a vintage bass is low end, sustain and low price. How did you discover Waterstone Musical Instruments? A signature model 12-string bass guitar has been long overdue! I met Bob Singer through Mike Klein who works at our record label, Big 3. I love the look of vintage hollow body guitars made by Gretsch, Rickenbacker, Hofner, Gibson, Hoyer, etc. So we’ve incorporated some characteristics of each into the basses. Will you be using a Waterstone on stage? I have been using the Waterstone 12-string basses since December 2004 when I first received them. I see no point of having a signature instrument that I don’t use. You are a big proponent of passive electronics, why? Using passive electronics has everything to do with tone. I hate the sound of active electronics. What is your current rig set-up? For years you used all three outputs on your 12’s to drive three amps. Lately you’ve been using only one output. Why the change? Does Cheap Trick typically use the same front-of-house sound engineer at all your concerts? Is there anything done to enhance your bass tone out front? We travel with our own sound man. He doesn’t use anything but volume to enhance the sound. 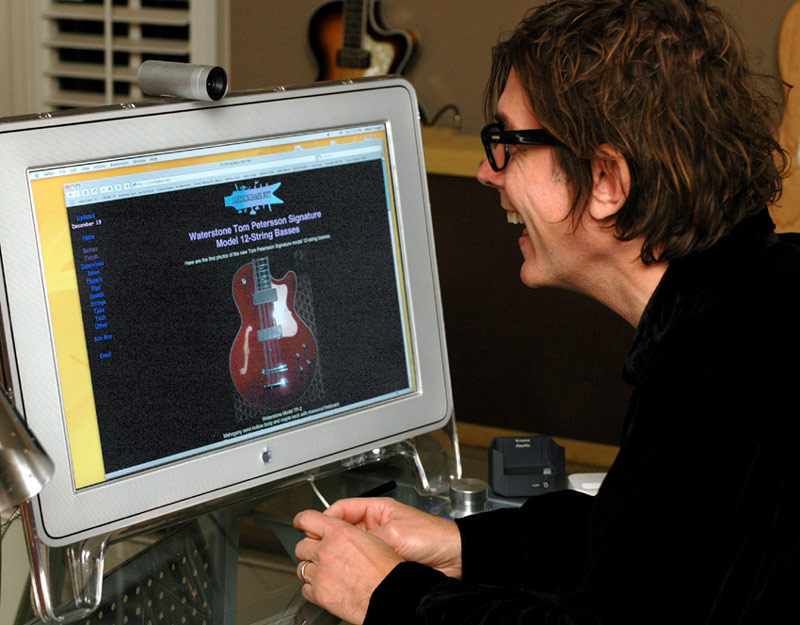 Tom Petersson checking out 12stringbass.net. It is often difficult to get a great 12-string bass tone when recording. How do you do it? Are there any tips you would care to share about getting a great recorded or live tone? The key to getting any great bass sound is to never record bass direct. Always use an amplifier. You have played a wide variety of basses over the years. Do you have any favorites? I own several basses and use almost all of them for recording. Besides my 12-strings, my favorite basses are my 1963-64 Gibson Thunderbirds, 1950’s and 60’s Fender Precision basses, 50’s and 60’s Hofner basses, a 1961 Rickenbacker 4000 bass, and a 1968 Fender Telecaster bass. Are there any bands or bassists that have inspired or influenced you lately? Lately I’ve been listening to Robert Wyatt, Sebastien Tellier, Rainer, Lambchop, Sigur Ros, Frank Black, The Magnetic Fields, The Fiery Furnaces, Chilly Gonzales, Morphine, Joseph Arthur, The Flaming Lips, The Dandy Warhols, Lucinda Williams and lots of others I can’t think of off the top of my head. I started out playing guitar so my biggest influences were George Harrison, Jeff Beck, and Pete Townshend. My favorite bassists still are Paul McCartney, John Entwistle, and Ron Wood. But I am really interested in songs more than anything. You have stated that you didn’t consider yourself to be an influence as a bassist, but it’s undoubtedly true that your pioneering efforts in developing and promoting the 12-string bass have inspired many of us. Does it make you proud to know that you have had a strong influence on us? It does make me happy that people like the 12 string bass. Who knew? Now I am stuck with it. Finally, if there is one specific thing you could be remembered for, what would it be? I would love to be remembered for the best bass tone in the world. I am still searching for it.